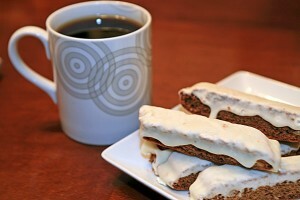 During the holiday season, one of my favorite treats at Starbucks is the Gingerbread Biscotti. I always look forward to spending my Saturday mornings, relaxing at Starbucks and dunking my biscotti into my Cappuccino. I always hate that the turn of the calendar means goodbye to the Gingerbread Biscotti. Since I’ve learned how to now make my own biscotti, I had to come up with a gingerbread recipe. So here it is – biscotti # 3! Preheat the oven to 350. Line a large baking sheet with parchment paper. Combine the cookie mix and butter in a large prep bowl and cream with a hand mixer until it’s fluffy. Add the eggs, one at a time (making sure to mix well before each addition). Gently fold in the macadamia nuts. Sprinkle a generous amount of flour to the dough. Pat flour into the mixture. Transfer the dough to a floured surface. If the mixture is sticky – continue to add more flour. Divide the dough in half. Using floured hands, shape the dough into logs. Brush off the excess flour. Place the logs on the baking sheet, spaced 5 inches apart. Flatten each log into a 2-inch-wide strip. Bake until lightly golden, about 30 minutes. Transfer the logs to a cooling rack and cool about 15 minutes. Reduce the oven to 300. Cut each log diagonally into thick slices using a serrated knife. Arrange the slices, cut-side down on the baking sheet. Bake until crisp, about 20 minutes. Transfer the slices to the cooling racks and let cool. Melt white chocolate chips in the microwave with a splash of water. Whisk until glossy and pour into a shallow dish. Dip the flat side of the biscotti into the white chocolate. Allow to drip and transfer to a baking sheet lined with wax paper. Chill for 1 hour to allow the chocolate to set up.